But listen, that’s really all very much just the flat-out reality of being awake and alive and breathing. I’d rather feel colorfully than not at all, even if it means painting in blues sometimes. Also, it’s Monday! And that is not always everyone’s favorite day of the week. I like to stack the projects of my week heavily towards the beginning—ticking off a to-do list on Monday makes everything seem more organized and more possible. I select simple-to-execute tasks for Monday: mail a funny postcard to my 11-month-old nephew, pay my electric bill, write a week’s worth of email marketing copy, fold the (GODDAMN) laundry. And if I have recipe testing to do, Monday is the best day to tackle that. One, I will have time to bring the extras to someone (some of today’s batch will go to the homeless shelter run by a church a few blocks from me; other times I bring them to friends or drop them at my husband’s office for the hordes of hungry engineers). Two, I have more time to tweak and re-test the recipe if need be. And three, I'll have cake to eat which is a surefire way to improve any Monday evening. Which brings us to today’s topic: buckwheat flour! I’d been reading in the latest issue of Food & Wine about this cool bakery in New Orleans that is selling freshly milled flour to some really excellent chefs, bakers, and restaurants. They included a recipe for lemon buckwheat shortbread cookies from a chef named Nina Compton (who actually won the last season of Top Chef, if you watch). So obviously I got my hands on some Bellegarde buckwheat flour as quickly as I could (strike while the iron of inspiration is hot, kids!). The flour is gorgeous: creamy-colored and flecked delicately with bits of grain. Unlike buckwheat flour I’ve bought in the grocery store before, it’s as light and fluffy as all-purpose flour. Reader, I made the cookies. (More on that in another post because sweet Jesus they are good.) But I couldn’t stop there, so I texted my friend Martin who is the head baker at King Arthur. 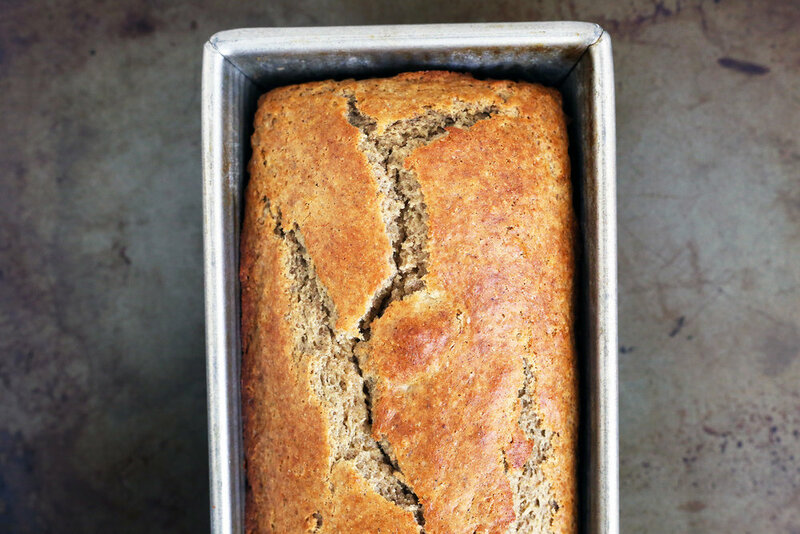 He’s always experimenting with unusual ingredients—particularly whole grains lately—so I merely had to say, “buckwheat flour?” and seconds later, had a recipe for cardamom buckwheat cake in hand. My loaf is more cake-like than Martin’s original would be—mine resembles the crumb of a classic quick bread like a lemon poppyseed loaf. Buckwheat has an earthy, slightly nutty flavor. To me, it tastes almost barely sweet, and I love love the taste of it with butter and spices. It’s subtle, but adds so much more flavor to baked goods than if you just used all-purpose flour. Two things I’ll do next time with this recipe: First, I’ll brown the butter. Why you ask? Don’t ever ask that. Just do it. Second, I’ll try using pistachio flour (just finely ground pistachios)—pistachios and cardamom are one of the nicest flavor combinations, so I suspect this would be good enough that I’ll want to eat the entire loaf. But as it is written below, it’s fantastic. I really had to restrain myself from demolishing a lot of it at once—it’s what the British call moreish, meaning you just want a little more and a little more. Preheat the oven to 375 degrees F. Line an 8” x 4” loaf pan with parchment, or just grease the pan well. In a large bowl, whisk together the flours, cardamom, baking powder, baking soda, salt, and sugar. In a separate bowl, whisk together the eggs, milk, yogurt, vanilla, and melted butter until smooth. Add the wet ingredients to the dry and mix gently to combine thoroughly. Pour the batter into your pan and bake for about 30 to 35 minutes. Start checking just before 30 minutes, and take the cake out of the oven when a skewer or knife inserted into the center comes out clean. Let cool in the pan for at least 5 minutes, then flip it out into a rack to finish cooling.